Researchers at the Buck Institute have corrected the genetic mutation responsible for Huntington’s Disease (HD) using a human induced pluripotent stem cell (iPSC) that came from a patient suffering from the incurable, inherited neurodegenerative disorder. Scientists took the diseased iPSCs, made the genetic correction, generated neural stem cells and then transplanted the mutation-free cells into a mouse model of HD where they are generating normal neurons in the area of the brain affected by HD. 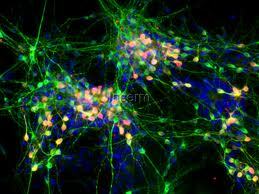 Results of the research are published in the June 28, 2012 online edition of the journal Cell Stem Cell. iPSCs are reverse-engineered from human cells such as skin, back to a state where they can be coaxed into becoming any type of cell. They can be used to model numerous human diseases and may also serve as sources of transplantable cells that can be used in novel cell therapies. In the latter case, the patient provides a sample of his or her own skin to the laboratory. “We believe the ability to make patient-specific, genetically corrected iPSCs from HD patients is a critical step for the eventual use of these cells in cell replacement therapy,” said Buck faculty Lisa Ellerby, PhD, lead author of the study. “The genetic correction reversed the signs of disease in these cells – the neural stem cells were no longer susceptible to cell death and the function of their mitochondria was normal.” Ellerby said the corrected cells could populate the area of the mouse brain affected in HD, therefore, the next stage of research involves transplantation of corrected cells to see if the HD-afflicted mice show improved function. Ellerby said these studies are important as now we can deliver patient-specific cells for cell therapy, that no longer have the disease causing mutation. Huntington's disease (HD) is a devastating, neurodegenerative genetic disorder that affects muscle coordination and leads to cognitive decline and psychiatric problems. It typically becomes noticeable in mid-adult life, with symptoms beginning between 35 and 44 years of age. Life expectancy following onset of visual symptoms is about 20 years. The worldwide prevalence of HD is 5-10 cases per 100,000 persons. More than a quarter of a million Americans have HD or are "at risk" of inheriting the disease from an affected parent. Key to the disease process is the formation of specific protein aggregates (essentially abnormal clumps) inside some neurons. All humans have two copies of the Huntingtin gene (HTT), which codes for the protein Huntingtin (Htt). Part of this gene is a repeated section called a trinucleotide repeat, which varies in length between individuals and may change between generations. When the length of this repeated section reaches a certain threshold, it produces an altered form of the protein, called mutant Huntingtin protein (mHtt). Scientists in the Ellerby lab corrected the mutation by replacing the expanded trinucleotide repeat with a normal repeat using homologous recombination. Homologous recombination is a type of genetic recombination where two molecules of DNA are exchanged. In this case the diseased DNA sequence is exchanged for the normal DNA sequence. Contributors to the work: Mahru An and Ningzhe Zhang are shared first authors of this study. Other Buck Institute researchers involved in the study include Gary Scott, Daniel Montoro, Tobias Wittkop, and faculty members Sean Mooney and Simon Melov. The work was funded by the Buck Institute and the National Institutes of Health. About the Buck Institute for Research on Aging The Buck Institute is the U.S.’s first and foremost independent research organization devoted to Geroscience – focused on the connection between normal aging and chronic disease. Based in Novato, CA, The Buck is dedicated to extending “Healthspan”, the healthy years of human life and does so utilizing a unique interdisciplinary approach involving laboratories studying the mechanisms of aging and those focused on specific diseases. Buck scientists strive to discover new ways of detecting, preventing and treating age-related diseases such as Alzheimer’s and Parkinson’s, cancer, cardiovascular disease, macular degeneration, diabetes and stroke. In their collaborative research, they are supported by the most recent developments in genomics, proteomics and bioinformatics.